The Dube TradePort Corporation is charged with the responsibility to develop the province's biggest infrastructural project. The designated Special Economic Zone (SEZ) is home to the state-of-the-art King Shaka International Airport and is ideally positioned 30 minutes from Africa's busiest cargo port, Durban Harbour, and 90 minutes from Richards Bay Harbour. 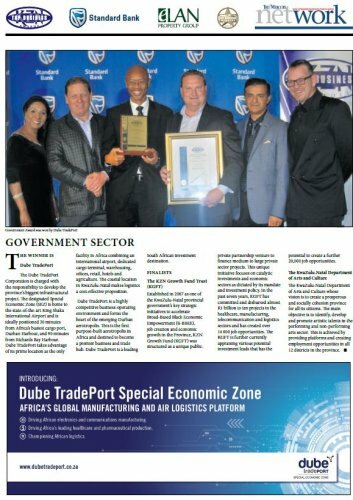 Dube TradePort takes advantage of its prime location as the only facility in Africa combining an international airport, dedicated cargo terminal, warehousing, offices, retail, hotels and agriculture. The coastal location in KwaZulu-Natal makes logistics a cost-effective proposition. Dube TradePort is a highly competitive business-operating environment and forms the heart of the emerging Durban aerotropolis. This is the first purpose-built aerotropolis in Africa and destined to become a premier business and trade hub. Dube TradePort is a leading South African investment destination. Established in 2007 as one of the KwaZulu-Natal provincial government's key strategic initiatives to accelerate Broad-Based Black Economic Empowerment (B-BBEE), job creation and economic growth in the Province, KZN Growth Fund (KGFT) was structured as a unique publicprivate partnership venture to finance medium to large private sector projects. This unique initiative focuses on catalytic investments and economic sectors as dictated by its mandate and investment policy. In the past seven years, KGFT has committed and disbursed almost R1 billion to ten projects in the healthcare, manufacturing, telecommunication and logistics sectors and has created over 14 000 job opportunities. The KGFT is further currently appraising various potential investment leads that has the potential to create a further 20,000 job opportunities. The KwaZulu-Natal Department of Arts and Culture whose vision is to create a prosperous and socially cohesion province for all its citizens. The main objective is to identify, develop and promote artistic talents in the performing and non-performing arts sector. This is achieved by providing platforms and creating employment opportunities in all 12 districts in the province.